Locus typicus: Spanien, Kanarische Inseln, La Gomera, Valle Gran Rey, La Playa, 50 m.
Erstbeschreibung: HAUSMANN, A., MILLER, M. A., LEIPNITZ, M. & R. BLÄSIUS (2007): Idaea nigra Hausmann & Bläsius, sp. 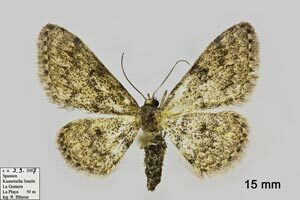 n. from La Gomera, Canary Islands, Spain (Lepidoptera: Geometridae, Sterrhinae).  SHILAP Revista de Lepidopterología 35 (140): 499-505 [PDF auf redalyc.org].